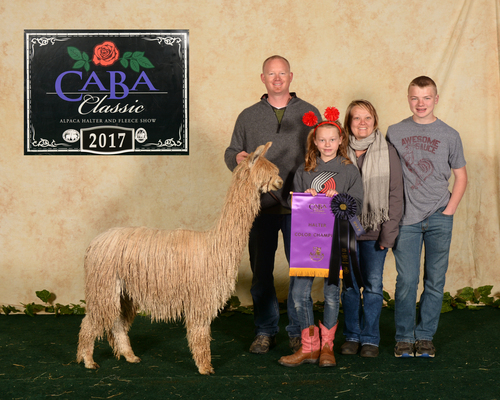 2017 CABA Light Color Champion! From the Accoyo Uribe and Accoyo Baron bloodlines. Tourbillion has silky and extremely lustrous locks to the skin which he inherited from his uncommonly fine fleeced dam, Accoyo Esperanza. 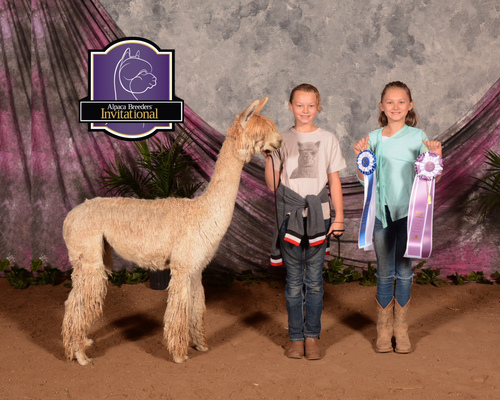 Her dam (his grand dam), PPeruvian Eleuteria R0666, a full Accoyo import continues to produce a fleece at 12+ years of age with an incredible micron count of 22 and was awarded a blue ribbon at the 2006 Suri Network Fleece Show in Estes Park, CO! On top of that, Eleuteria has had a cria every year since 1996 and is a supermom with lots of milk which produced Tourbillion's dam who has the same milk production giving Tourbillion a great start! Folks, this is what we want in OUR herd; SUPER GENETICS producing HEALTHY BABIES with OUTSTANDING FLEECES. Now, add limited genetics with correct conformation, strong bone and a gorgeous head and you have Tourbillion; a name indicative of exquisite craftsmanship and we are proud to offer his genetics. 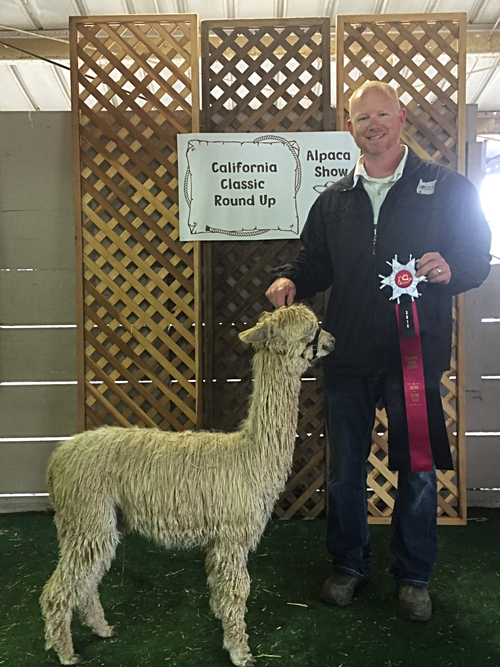 Congratulations Cammie & Craig Nussbaum of Alpacas on the Horizon on her purchase of Cranberry! Here is a real opportunity to own one of Norm Evans top biopsied suri females! 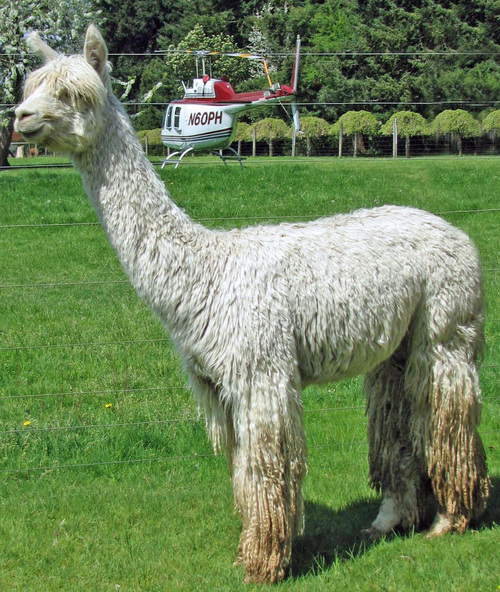 Vega was the first cria out of Cranberry Kir Royal now owned by Alpacas on the Horizon! This guy has all of his dad's beautiful fleece traits with a great combination of both parents density! Vega was very impressive for his 2017 show career finishing as the CABA Classic Halter Champion! 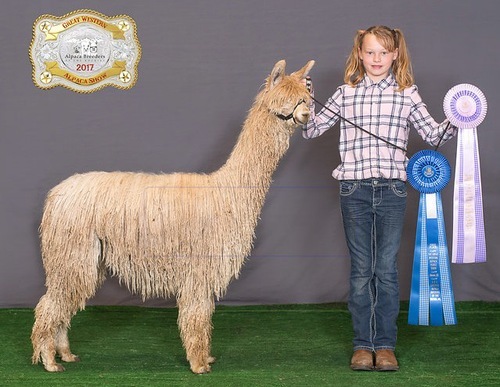 “Rogue Suri Alpacas RGSA Tourbillion’s Vega” was biopsied as a 22 month old light fawn suri male with ARI#35146926. His 15x scan shows fiber clusters mostly uniform in size, shape and placement within his connective tissue. He grades level 4 of 4 glands which are viewed as the gray lobulated structures around his follicles. Observe the 5 fiber clusters on the S/P scan that show an S/P ratio of 8.4 to 1. Twenty five clusters showed an average S/P of 8.7 to 1. His density measures 59 follicles SQ MM of skin. 100 secondary fibers average 17.4 microns while 50 primary fibers average 26.1 microns for a variation of 8.7 microns. Also note on all scans that 100% of his secondary fibers show medullation. On June 24, 2017 Vega’s AFD is 18.39 microns.